Welcome to PAXbaby’s Woven Wrap Guide where you can learn to walk the walk and wrap like a pro! For a more extensive list of carries & resources, please visit PAXbaby’s Woven Wrap Carry List here!!! Delve in, and please let us know if you have ANY babywearing questions! We are here to help!!! PAXbaby’s FaceBook page is chock-a-block with pictures, stories, and information as well, so if you aren’t a PAXbaby friend yet, come on over! You may have heard other babywearers conversing and using strange terms like “DH,” “cross passes,” or “RUCK” and wondered to yourself what exactly they meant! Well, now you can study up and be able to engage in any woven wrap conversation without feeling squeamishly in-over-your-head! Babywearing is already a world of its own, but the Woven Wrap vocabulary lends an air of mystery and European sophistication to your babywearing skills! 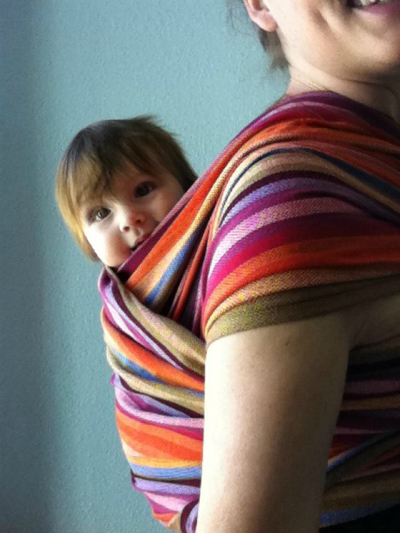 Whether you are in love with a rainbow wrap, or a stripey sling, this blog post from PAXbaby will assist you to sound, and feel, like a true woven wrapaholic! As Maria from the Sound of Music would say, let’s start at the very beginning, a very good place to start! A Woven Wrap is called WOVEN because it is loomed (often by hand!!) by a skilled weaver. A Wrap is a long piece of cloth used to secure your baby to your body. The continuous length of fabric offers support unlike any other baby carrier and is non (or very slightly) stretchy so that a single layer is able to carry as much weight as you can hold! The techniques used to wrap are what give the baby stability and security, and upmost caution needs to be used when practicing and wearing a woven wrap! A Woven Wrap has a center (usually shown with a marker or tag) so that you can line your wrap up to your body as needed. The Wrap has 2 sides or edges called “rails.” These rails are referred to as the TOP rail or the BOTTOM rail depending on how you are holding your wrap. It is easiest to differentiate these rails as you wrap when your Woven Wrap has 2 differently colored edged (rails) so you may want to look for that when purchasing your first Woven Wrap. Featuring a variety of styles on the “tails” which are the ends that hang down, some wrap companies feature a severe taper, some a simple diagonal cut, some have a blunt edge, and my favorites have a fringe on each end which look like tiny tassles all the way across the end of the tail! When measuring your Woven Wrap or when buying a Wrap, make sure to delineate or ask whether the measurement includes the taper or fringe! Moving onto measurements! It certainly doesn’t help the confusion of the Woven Wrap that they have 2 ways of sizing as well as being measured in meters so if you are like me, you are constantly switching tabs to check the conversion from meters to feet and inches! In order to help you, this is a list of the standard Woven Wrap lengths in regular sizes, metric sizing, as well as US standard sizing. Now, it’s time to choose your Woven Wrap! You have SO many choices of how to wear your baby in a Wrap from front to back to hip to high back carry to tandem carry! You will want to choose a Woven Wrap based on what you want to do with your wrap! Your size makes a difference too, but *most* average size people can do *most* carries with a size 6 Woven Wrap which by consulting the chart above, you know is 4.6 meters! If you are larger than average, pregnant, or have an unusually large chest, choose the size 7 or even the 8 which are 5.1 and 5.6 respectively. If you are petite with a narrow frame, you can eek out most carries with a size 5 at 4.1 meters. My personal favorite is called a “shorty” which is traditionally a size 2 or 3, 2.7 or 3.1 meters long. It’s portable, quick, doesn’t drag on the ground, and can be used with a multiple of carries without having overwhelming options. Sometimes, you will buy a Wrap that looks lovely but truly feels like a window drapery ! These Wraps need to be “broken in!” Don’t worry about injuring the Wrap (avoid sharp snaggly things like nails and cat claws) but some helpful things to do with your Wrap to help soften it up are to braid, wash, iron it, sleep, sit or swing on it, let baby use it as a hammock, let a friend borrow and use it, use it as a blanket, picnic table, sunshade in the car! Anything that gets it moving and loose will help your Woven Wrap reach that state of floppy Wrap nirvana that you are looking for! Once you have your Woven Wrap home with you, don’t be scared to actually wear it! Baby may spit up on it, and your toddler may mistake it for a VERY pretty napkin, but the great news is that for most Woven Wraps, a simple Delicate cycle in the washing machine with cold water and line dry will keep your wrap in great condition! The weave of the fabric will shrink, but the sizing should have taken that into account. When you buy a Woven Wrap whether new or used, measure when it arrives to confirm its length but keep in mind that it will shrink upon washing! See the above sizing statement for that information. Actually wrapping with a Woven Wrap can prove to be more difficult than one would think! I know that I studied up on YouTube, practiced while pregnant, and broke in my Woven Wrap to be ready to wrap proficiently with 100% and total failure! My arms weren’t behaving the way I was asking them to, my baby kept wibble wobbling and giving me a mini hearth attack, and the rails kept getting twisted even after I smoothed and re-smoothed! I was anxious, stressed, and unable to deal. Fast forward to my next baby, and slowly but surely, since thankfully Baby #6 is a much more patient child than Baby #5 was as a baby, I am learning the ins & outs of wrapping, or should I say the folds & knots! Woven Wrap wearing is all about patience, dexterity, and the ability to follow a series of directions from start to finish. Whether you are a visual learner from pictures or videos or actually in person, there are resources for you! Please visit PAXbaby’s Woven Wrap Carry List here!!! Rails = the edge of the wrap that run lengthwise. These are hemmed in a variety of ways including double rolled, flat, or simply using the selvedge edge! Reinforced = the rails of the wrap cross over baby more than once creating more support! Weaves = the way that the wrap was woven. There are a multitude of weaves such as flat, twill, broken twill, jacquard, and diamond! Tails = the ends of the wrap which can be tapered, diagonal, straight, or fringed! Seat = the part of the wrap where baby’s bum sits! The bottom rail on the seat should be tucked up through baby’s legs creating an actual seat, and the edges should be tucked under baby’s legs! Pass = each time you wrap across baby’s body, it is a pass! keep your passes taut and tucked smoothly to create the tidiest, most supportive carry possible! Poppage = a universal nono! When baby’s bum loses its “seat” or comes out of the wrap, thus exposing baby’s body without any support and risking safety! Weft = the threads running widthwise. When the color of the weft is changed, the entire look of the wrap is changed! Warp = the threads running lengthwise. These are the main colors used in the wrap and can be a solid, stripes, or a pattern! Think creatively when wrapping and don’t be scared to try something new! Add a set of sling rings to the end of a wrap to create a Ring Sling style carry! 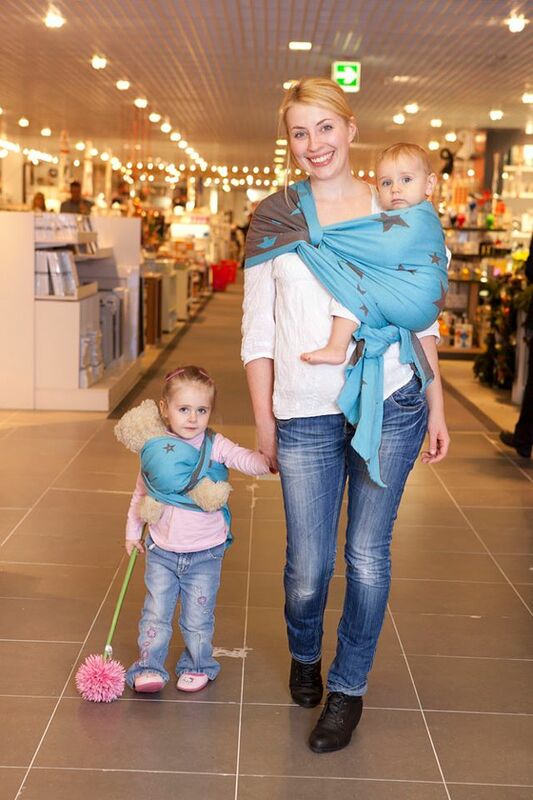 Carry 2 babies in 1 wrap using a tandem carry! Challenge yourself to ONLY wrap for a week in order to get that new carry down, or to ONLY back wrap for the day to see if you can master that new positioning! Remember, babywearing is meant to be a fun way to bond with your baby and keep your hands free! Obsessing and shopping compulsively for new carriers is NOT mandatory but does come with the territory! AWESOME Jillian, Love the article. Great info, I will be refering alot of people to this! Thank you! I am new to wrapping. I used a SSC with #1. I figure #2 will be worn alot and is due to arrive in July. I know I will need to practice. What is a cool wrap that is not too hard to conquer? I am looking at an Ellaroo since it seems to be the thinnest(?) woven. However, i have seen bamboo blends. Would they be cooler and easier to use? Thanks for your help! Is it safe to tie the wrap off on the tails? I was wondering what size is best for twins and what you think about the Moby brand of wraps? It is actually recommended for each baby to be in their own separate carrier. Either two ring slings, a soft structured carrier and a woven wrap, two soft structured carriers… the possibilities are endless. As for a Moby wrap, they are soft and snuggly for babies under 15lbs. If you are looking for a great stretchy wrap that is going to last you, I would suggest looking into the amazing French wraps we are carrying right now, http://shop.paxbaby.com/je-porte-mon-bebe/?sort=featured&page=1. Je Porte Mon Bebe wraps are a hybrid stretchy wrap, and are approved for back carries, and even carries with heavy toddlers! Please email us at help@PAXbaby.com, if you would like to chat further! That is the gorgeous Girasol Amitola! I LOVE the type of wrap you did on the third picture down (the one with the yellow, green, brown and orange stripes)!!! Does it have a name so I can google how to do it? Thanks so much for this article!! I refer to it all the time! It is beyond helpful! Thanks! I was guessing that. Confirmed that I’d like to try one! When measuring a wrap’s length, is it just the length of one rail? Or is it the length not including the tails; measure the length of a rail before the tail starts? This looks like a Back Wrap Cross Carry with a Sweetheart Neckline, Arian! Hello what is the name of the wrap that is in the pic below the measurements of wraps. It is striped and a brunette boy is in a back carry.